Fashion should be fun. So for Style Steals today it is a super fun collection for Summer! Style Steals - 6/8/16 - Animal Collection for 50% Off + FREE SHIPPING w/code ANIMALJAM. Let your happy little animal friend play peekaboo with the Penny shirt. This three quarter sleeve raglan shirt will give you a fun, unique look with the printed pocket. Let your quirky side peek out like the animal peeking out of this printed pocket. Pair Penny with anything from your favorite sneakers and jeans to a pencil skirt for a more dressed up look. 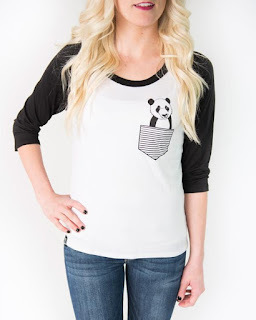 Very soft white and black, hi-low, 3/4" sleeve raglan tee shirt which has a animal pocket print accent.